The Dwarf Crowned Snake has a very narrow yellow collar at the back of the head and its belly is yellow with thin black bands. This, the smallest of the crowned snakes, is fully grown at only 25 cm. 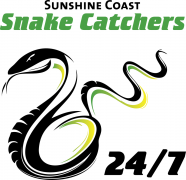 The least encountered on the Sunshine Coast of the crowned snakes. Prefers wetter forested suburbs including but not limited to the Sunshine Coast hinterland, Nambour, Buderim, Beerwah, Nambour and Doonan.